"Our pizzas are made with Italian Caputo flour and they are rolled in a mixture of flour and polenta to give them crunch. When you’re baking pizza there’s a double bake - because the slices go back to be reheated - so there’s a balance of various proteins that need to be doing the right thing to have a properly structured slice. We did a lot of research and we worked with a few different people to get the dough right because that’s the foundation of the whole business. We’re really happy with it. There’s some architecture involved in making 22-inch pizzas and they have to tick a lot of boxes. They have to be crispy but not biscuity. A good crust, but never bready. They have to hold the topping, so there’s a lot going on. 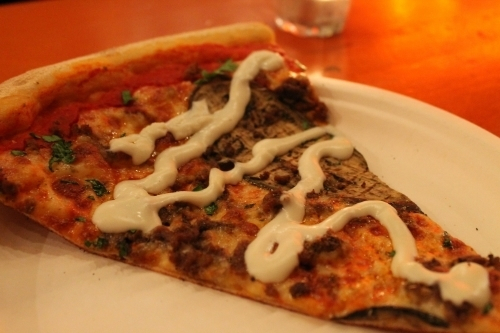 The initial topping ideas are largely mine, although one thing we wanted to do was the standard regular slice, which in New York is different from a Margherita. That’s what we wanted to do here, a really good value regular slice, which instead of having mozzarella on it has fior di latte, then you can upgrade to the mozzarella. We’ve also got access to a really good recipe for Napoli sauce which is made here. There’s a lot of balancing going on, it needs to be relatively neutral so it doesn’t overpower the flavours but you need to get the sweetness of the tomatoes you need to get a tiny bit of oregano and garlic but without being overpowering."